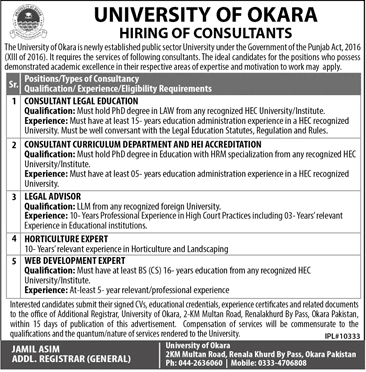 The University Of Okara in newly established public sector university Under the Government of Punjab Act, 2016, it requires the services of following consultants, The ideal candidates for the positions who possess demonstrated academic excellence in their respective areas of expertise and motivation to work may apply. Interested candidates submit their signed CVS, educational credentials, experience certificates and related documents to the office of Additional Registrar, University Of Okara, 2-KM Multan Road, Renalakhurd bypass, Okara. within 15 days of publication of this advertisement.